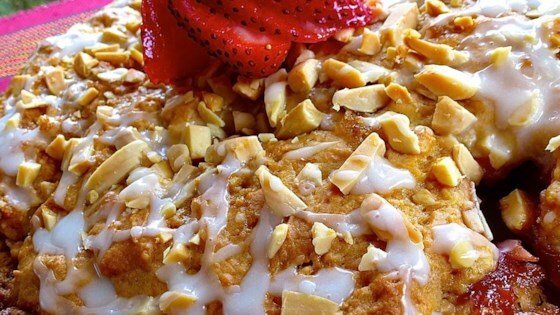 Delicious Strawberry Almond Coffee Cake - A Guilt Free Indulgence! "This very easy and fun cake made from scratch is a moist, light cake good as a dessert, breakfast, or brunch. A berrylicious delight which can satisfy a baker's ache to bake! Your home will just smell wonderful while it is baking and cooling." Preheat oven to 350 degrees F (175 degrees C). Grease and flour an 8-inch round cake pan. Mix strawberries and 3 tablespoons brown sugar together in a bowl. Mix flour, 1/3 cup brown sugar, baking powder, baking soda, and salt in a separate large bowl. Whisk yogurt, melted butter, vanilla extract, and egg in a third bowl. Stir yogurt mixture, alternating with milk, into flour mixture until just moistened. Spoon 2/3 of the batter into the prepared pan; spread strawberry mixture evenly over batter. Top with remaining batter. Sprinkle almonds over batter. Bake in the preheated oven until a toothpick inserted in the middle of the cake comes out clean, about 40 minutes. Let cool in pan atop a wire rack for 10 minutes. Run a knife around the edge of the pan before transferring cake to a serving platter. This is excellent. Add a little more milk in the end and Yes it is thicker than you'd think, however it rises up beautifully. I've made this twice and used blueberries as well. Oh so VERY YUMMY!! I did not care for this recipe. The proportions are wrong and hard to mix.